Mei Chi Sorensen and her husband Jerry stand beside a bookshelf in their Manti home. 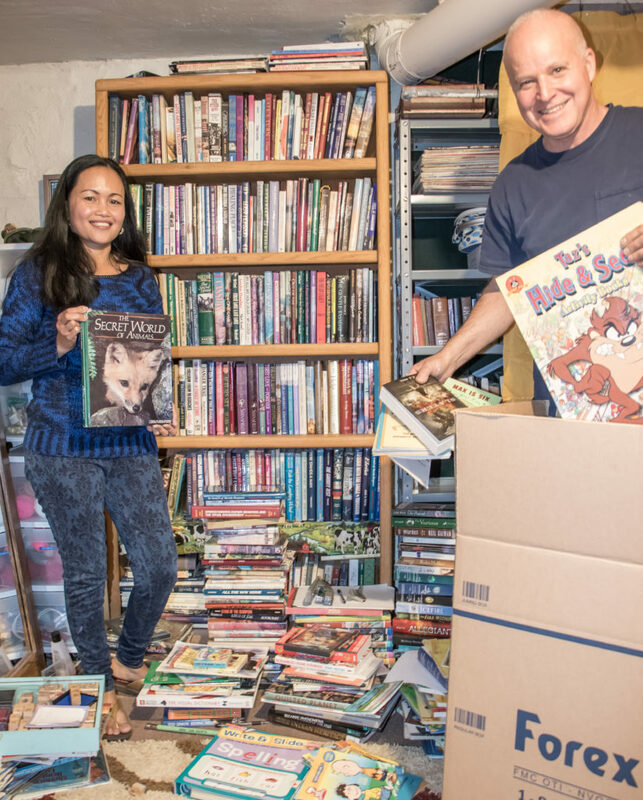 The books have been bought and gathered by the couple to send to the Philippines to help accomplish Mei Chi’s dream: Having a library for the underprivileged children from her foreign home. MANTI—It’s no surprise that a librarian loves books, but Mei Chi Sorensen of Manti knows their true value. After overcoming overwhelming challenges to escape an oppressive government regime in the Philippines, get an education and arrive in America, she is working to fulfill her dream of having a library in her childhood hometown in the Philippines, where those in her homeland remain under the yoke of oppression and poverty. Mei Chi says she is determined to make a difference, and she’s already walking the path to her dream, even at her own sacrifice. “The feeling when you learn something new is amazing,” Mei Chi said. That is why she said is starting a library back in her childhood hometown in the Philippines—especially for children to read and learn during their young and impressionable years. As a child, Mei Chi said she loved reading more than anything else, but reading material was hard to come by. In fact, everything was hard to come by during her childhood in the Philippines. Mei Chi said the government forced her family to move to away from Manilla to the municipality of Silang in the province of Cavite when she was 8 years old. In her new home, everyone struggled just to eat, she said. Underprivileged children in Silang in the province of Cavite in the Philippines teach each other to read at the library Mei Chi and Jerry Sorensen of Manti are slowly but steadily building by sending books to the impoverished area that Mei Chi spent her childhood in before escaping. She now works at the Manti City Library surrounded by her favorite thing in the world: Books. for their children, said Mei Chi. But Mei Chi didn’t leave her love affair with all things literary and learning behind in Manila. She said she soaked up every scrap of paper with writing on it she could find. She loved comics with their colorful illustrations. If it had words or pictures on paper, she cherished it. Once, said Mei Chi, her parents had to burn her books to cook their food to eat. “I was heartbroken,” she said. And so Mei Chi dreamed of escaping the struggles and squalor of her homeland and yearned for a true education. Mei Chi eventually made her way to Japan, where she studied the Japanese language. In 1996, she went to National Chiayi University in Taiwan, where she studied Mandarin Chinese—one of the most difficult languages to learn. She graduated at the top of her class. While in Taiwan, she met her future husband, Jerry Sorensen. Mei Chi was teaching English at a government school where Jerry also worked. They fell in love and were married. 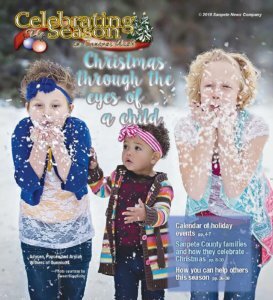 In 2015, the Sorensens gave up their Taiwanese citizenship to live near Jerry’s father, Rey, in Manti. In March 2017, Mei Chi found work at the Manti City Library, where she is privileged to work with books every day. “The job just kind of fell in her lap,” said Jerry. Mei Chi rose from the ashes of her childhood and has become an educated woman fluent in four languages—Mandarin Chinese, Japanese, Tagalog and English. Surrounded by books in a free land, one might think this woman, who had escaped from a childhood of constant struggle in her homeland and elevated herself through education, would be content. She is for herself, but she never forgot the conditions of those in her homeland. Mei Chi said she worried for her family and her countrymen still facing the struggle she escaped, and she wished she had some way to help them. Mei Chi said her husband and his father, Rey, are so proud of how far she has come, and they wanted to be supportive of her dreams. Mei Chi and Jerry committed to taking trips back to her homeland, bringing food during the early trips to her loved ones. Mei Chi began buying and gathering books, especially children’s books. She sent them to the Philippines in large, expensive-to-ship boxes mandated by the government of the Philippines. But Mei Chi knew from personal experience the real value of those boxes. They were packed full of knowledge and the potential of learning. Her sister, who ran a small shop in her hometown, set up a pair of shelves, and the seeds of a small neighborhood library were planted. What happened next is tied to Filipino cultural characteristics, said Jerry. 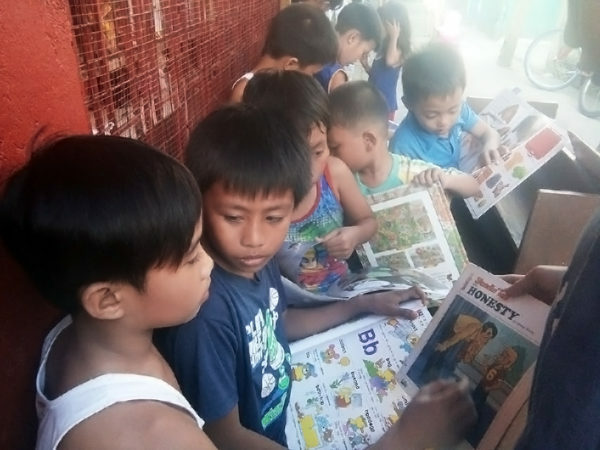 With access to this influx of reading material, the older children who knew how to read English (the adopted language of the Philippines) began to take the younger children under their wings and teach them how to read. After seeing the effects of her miniature library (through photos and videos shared over social media) on the children back in her hometown, Mei Chi set out on a mission. So the Sorensens gather and buy books, books of all types. Since the beginning of their efforts to help those of her home country, Mei Chi and Jerry are candid that they have spent a lot of money on her dream of making a difference, including the costs of trips, supplies and expensive shipments. Their basement bookcase is overflowing with the books she plans to send to her homeland in the large boxes, but they can only send so much at a time—especially since the cost to ship overseas the boxes mandated by the government in the Philippines is so exorbitant. The couple said someday they would like to hire a teacher to provide an education to underprivileged Filipino children who visit the neighborhood library. That may sound at first like a lofty goal, but it would only cost roughly $5 per day to hire a local teacher help underprivileged Filipino children get the beginnings of a formal education. The Sorensens have already spent more than a teacher’s salary for a year just taking food and sending books for Mei Chi’s library. If anyone wants to contribute to Mei Chi’s dream and the academic development of Filipino children who want and need an opportunity to learn, contact Mei Chi and Jerry at 835-9142 or at jerryrsorensen@yahoo.com. Items most needed, said Mei Chi, are children’s books and the special boxes to ship them in.